SPRING GROVE, Ill. (WLS) -- The Richardson Adventure Farm's 2017 corn maze in northern Illinois debuted on Friday and was caught on camera by Chopper 7 HD. The maze celebrates the Cubs' World Series win after a 108 year championship drought. 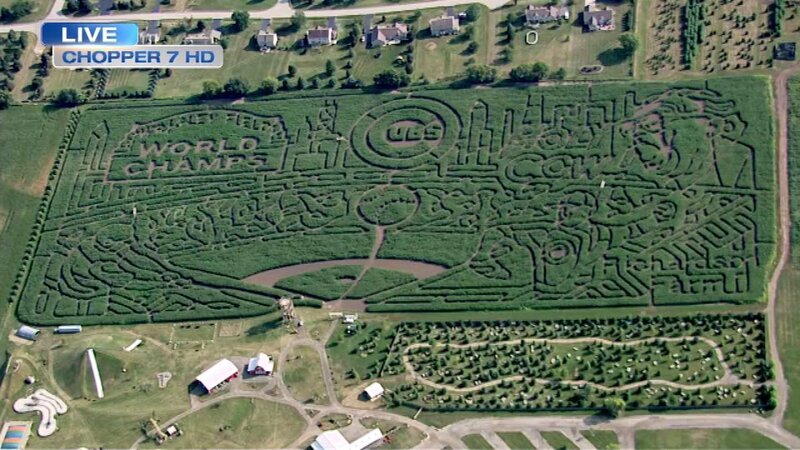 The elaborate, 28-acre maze features the Wrigley Field marquee, the Chicago skyline, a batter, a pitcher, the outfield ivy and Harry Caray proclaiming, "Holy Cow!" The farm has been in the Richardson family since 1840 and created their first corn maze in 2001. In years past, the corn maze has celebrate the anniversary of "Star Trek" and the Blackhawks 2015 Stanley Cup win. Not into corn mazes? The farm also has pig races, wagon rides and a zip line. Richardson Adventure Farm opens for the season on Saturday, Sept. 2.